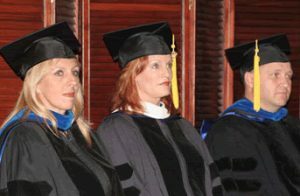 San Diego University for Integrative Studies is proud of its affiliated core and adjunct faculty. Embodying the qualities of scholar-practitioners, they bring to their classrooms and to our curriculum their academic wisdom and training, as well as their worldly experience and commitment. Believing in personal exchange and exposure to a variety of thinkers and doers, San Diego University for Integrative Studies seeks out specialists to teach in each of its course areas. Input from such qualified faculty is sought at the curriculum development stage, as well. Faculty members are interested humans who believe that, by passing on their knowledge and expertise they can make a positive change in our collective future. Although San Diego University for Integrative Studies is a small university, it is not defined by a few full-time academics. Leaders, innovators, and traditional scholars all teach in their areas of expertise and interest. Over 90% of the faculty who have offered regular classes, from the Master’s level through the Ph.D. programs, hold terminal degrees in their areas of expertise. A look at the faculty list will provide the reader with a who is who in the teaching areas. Our faculty is deep and embraces a breadth that includes a multicultural and multinational perspective. They are professionals who are able to pass on practical wisdom as well, because they are active professionals who provide service to others on an ongoing basis. Teaching Specialty: Sport Psychology, Business Planning.